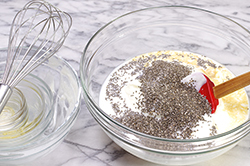 As if yogurt couldn’t get any healthier, the addition of chia seeds does just that! 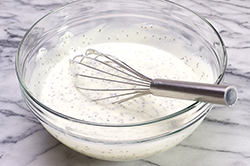 With an overnight soak in yogurt, the little seeds swell to tenderness and naturally thicken the yogurt. Chia seeds are low in calories (60 calories/tablespoon) and high in nutrition as a potent antioxidant, fiber source, and a great source of Omega 3 fatty acids. The result of this pairing is an ultra-nutritious breakfast that’s very satisfying. 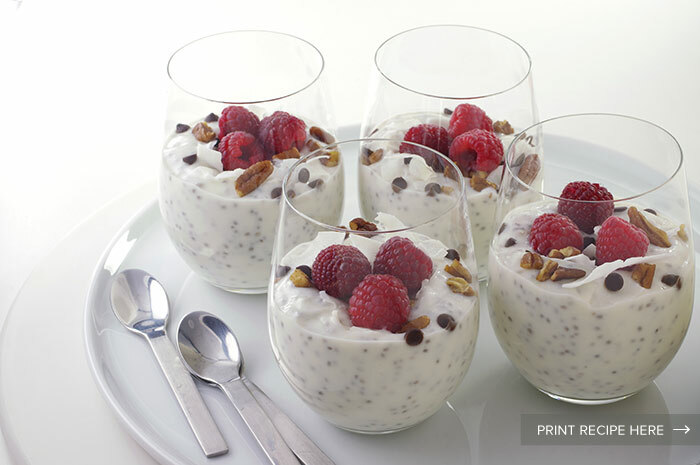 Dressed with a few toppings it makes a great everyday dessert. 1. 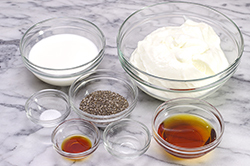 In a large bowl, whisk together the yogurt, milk, chia seeds, maple (or agave) syrup, vanilla and salt. Cover and chill for 12 hours, or up to 3 days. 2. Spoon the finished pudding into serving glasses or bowls. 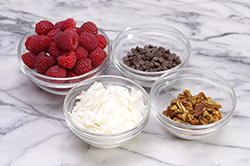 Top with raspberries, coconut flakes, chocolate chips, and nuts. Serve chilled.